I am taking part in the Spelling Bee Sew Along put on by Fat Quarter Shop and featuring Lori Holt’s new Spelling Bee book. Every Saturday 2 different quilters share their blocks. My block is the uppercase T and was super easy to make! I picked up a fat quarter bundle of Bella Solid and some matching Aurifil threads. This particular bundle is no longer available but there is a similar one called Hometown Christmas Stash that is even on sale! This is a great way to try out the Bella solids and Aurifil threads if you haven’t used them yet. I have also been making a few other blocks and I ended using some of the leftover Tea Rose Bella Solid that I have from the Bella Skillbuilder Quilt Along that I finished in February. There are links in that post to each of the blocks that I made. I finished piecing my quilt and I have sent it out to have it quilted. I’ll be sure and share my quilt when it comes back in 3 months. Here is my Uppercase T with binding on it. I thought I was all done until I realized I forgot to do any free-motion quilting on the T.
For my fabrics, I used White Bella solid and Tea Rose Bella solid. For my threads I used the large cone of 50wt Aurifil Natural White and Aurifil thread #2220 for the quilting on the letter T.
When I use the large cones of Aurifil on my vintage Singer I use a Cone Stand Thread holder. It was nice to have the perfect color of Aurifil thread for my quilting. I ended up finishing the Uppercase T and also the Lowercase t.
There is a great group of 40 quilting bloggers joining the Spelling Bee Quilt Along event. 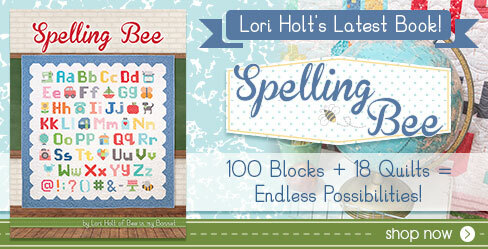 Each week, 2 of the 40 bloggers will be sharing their Spelling Bee blocks with you! Be sure to visit the Jolly Jabber for the whole list of bloggers and details on what they did with their Spelling Bee blocks! And check out #SpellingBeeSaturday on Instagram to keep up with the fun! I use affiliate links. At no additional cost to you, when you make a purchase I may get a small commission. Your support is very appreciated. Thank you! I love Lori Holt’s designs. I have this book too, and just finished a pillow top with granddaughter Olivia’s name on it. I need to give it a little quilting before adding the envelope back to finish it. And I’m planning to do ones for the other grandkids too. Maybe save them for next Christmas. Very cute. It looks great as a stand alone with the small t.